The official launch starts Monday, November 13th. That’s when I’m officially opening sales for two the new books. I’ve created some bundles to help you fill out your library – and improve your business. Managed Services in a Month is and has been the #1 book for Managed Services on Amazon ten years. I assume that will continue with the new edition. 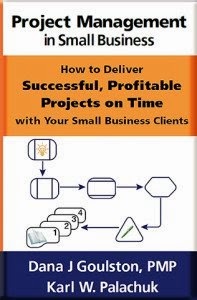 The #2 book on Amazon for Managed Services is usually Service Agreements for SMB Consultants. Again, with a revised and expanded version, I believe that will continue. In this double book launch, I’m selling them as a set for only $59.99. Remember: These books will not be available on Amazon until January. We’re doing pre-sales in November. We’re releasing ebook versions in December, and the paperbacks will be out in January. 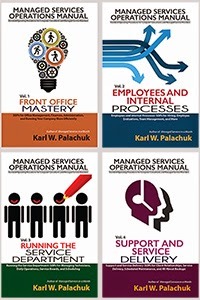 My very popular 5-week class “Managed Services in a Month – Applying the Book” will also be offered at an amazing price. 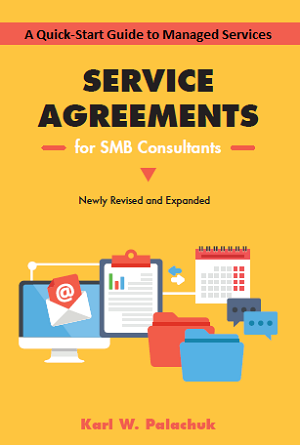 And I’ve created a whole new class on Service Agreements for SMB Consultants – Applying the Book. That will be offered at a one-time price as well.
. . . AND more . . . There are so many new things in our business, it’s important to keep refreshing what you do and how you do it. Even if you have a successful model, it’s good to consider other alternatives. One of the early readers of Managed Services in a Month declared it to be the an extremely thorough guide to managed services. But isn’t Managed Services all the same? No. Not even close. In fact, most people who call themselves managed service providers spend most of their time providing reactive support! They’re using modern tools to provide the same old service. 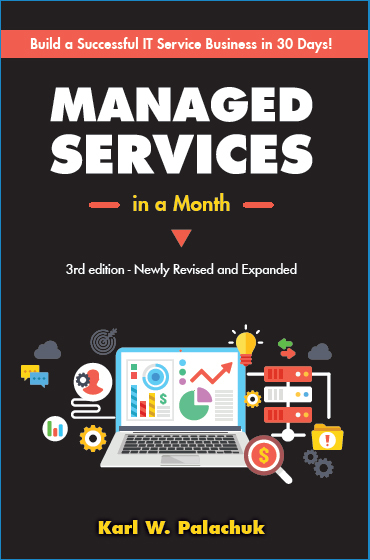 The 3rd Edition of Managed Services in a Month is more comprehensive than earlier versions and really gives a complete view of what can be done when you go all-in with managed services. Recap: The special sale goes live Monday the 13th. Keep an eye out for another post from me. In a couple days I’m going to talk about the bigger opportunity to commit to your business and set the stage for an amazing 2018. In the meantime, please make a comment on YouTube, my blog, or social media. What’s the one thing you need most to make your I,T. business more successful in 2018? More Private Equity for Kaseya: TPG Capital Investing? A Buncha Friends Got Together for a Sale . . . Double Managed Services Book Launch is LIVE! Attend NexGen 2017 Free - on Me!